Mike Heck. 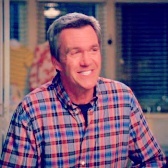 Neil Flynn as Mike Heck. Images in the Frankie & Mike Heck club tagged: photo the middle neil flynn mike heck.